Valentine’s Day is nearly upon us. One way to spice up your romantic evening is to add some flair to your interior decoration. You can set the mood or simply celebrate with a little do-it-yourself attitude and a few relatively cheap and easy-to-obtain decoration supplies. When it comes to interior painting, remember that not all interior paint jobs have to be permanent, and you have the freedom to return to your normal color schemes if you’re careful and keep your interior redecorating paint jobs simple. Valentine’s Day is all about reds, pinks, and purples. Combining these colors with a few creative interior decorating projects can create a romantic and celebratory atmosphere. Without further ado, let’s look at a few simple ways to get your interior space ready for the most romantic of holidays. Scented candles add romance to the air with their light and smell. Top off this exquisite, romantic touch with hand-made candle holders. There are many ways to make holders yourself, but one idea is use small, flexible bush or shrub branches that can be bent into circle and tied. You can also turn items like ashtrays, small bowls, and teacups into simple-yet-effective candle holders. If you don’t know what I mean by sculptural branches, check out this example. Tree or shrub branches with flowers or colorful leaves are a great way to add some natural flair to a space without using the same old floral arrangement. Get a good-sized vase and find a few particularly beautiful branches to harvest, and you have a unique twist on the traditional flower arrangement for Valentine’s Day. Another fresh twist on traditional flower arrangements and decorations is a framed sketch or painting of flowers. If you have an artistic bent, this is a great way to show off your skill and create a beautiful piece of decoration for any room. Remember making Valentine’s Day cards for your peers in elementary school? Making a paper heart wreath will take you back. 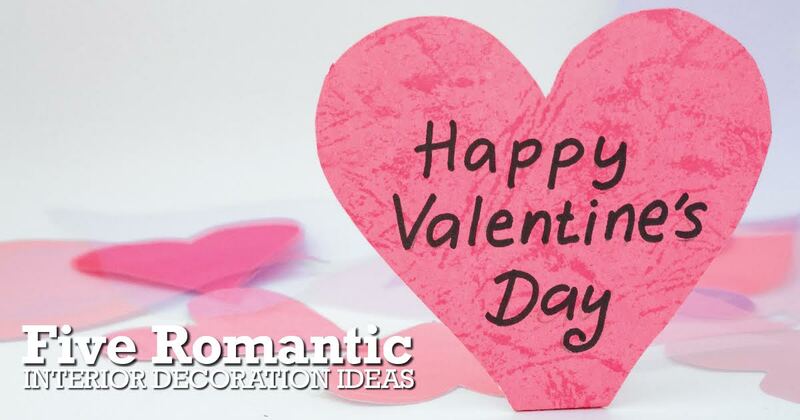 Simply get a few pieces of construction paper, preferably red, pink, or some design and combination of the two, cut out several heart shapes to a size of your choosing, and link them all together with a decorative ribbon. Bonus points if you can hang the wreath in a heart shape on the wall. Hint: you’ll need multiple sticking points to the wall. A velvet, purple throw pillow or two on your sofa will not only bring some color to your living room, it will also bring a bit of comfort. Throw pillows can be had cheaply at thrift stores, which are pushing decorations for Valentine’s Day this time of year. If you can’t find a velvet throw pillow and you’re feeling ambitious, you can sew velvet material into a pillow case to turn your normal throw pillow into a Valentine’s Day decoration. Another Valentine’s Day decoration to try is an accent wall. Painting one wall of a room a soft or dark red, a playful pink, or a sultry purple is an easy way to instantly change the energy of a room. And the beauty of accent walls is that you can paint over them when Valentine’s Day is over.